When the time comes for us to forgive and repent and cower and beg. When the time comes for the shadows to fall across the sky and bleed. When the time comes for our world to shake and crack and burn. When the time comes…is now. It is time, gentlemen and gentlewomen. It has arrived. What has arrived? Death from the stars. 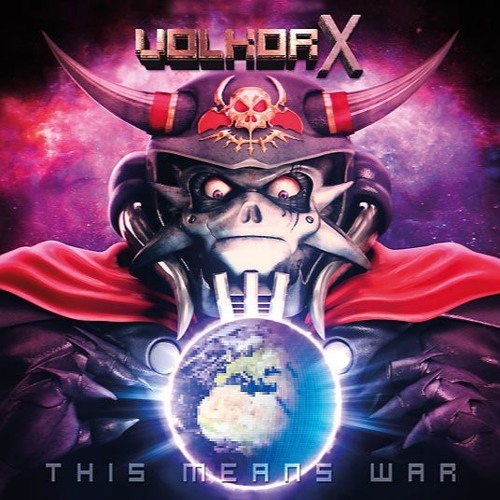 It’s Volkor X’s debut album, “This Means War”. It’s been in the works for a good long while, and after months of anticipation, the world has ended from this release. Welcome to death. Now, I know i’ve written a war poem for the dude, which he is currently using to promote his release today on his Facebook page, but there is no bias here. I’m a fair and constructive reviewer. The first track on the board is “Prelude To War”. This song is pretty chill for the most part, until about two minutes into it. The first minute or so is really 50’s sci-fi stuff, including the “woooo-ooooo-wooooo” stuff you see in trailers and alien spaceship noises. “Masked Death” is where Volkor’s army invades the world, or when the world itself panics in sync. Volkor would deliver a video message across the globe, warning those that nothing is safe, no-one will live, and all will perish. So far we’ve gone from a 50’s sci-fi movie trailer like The Green Slime, to an out-of-this-world alien movie like Xtro (both of which I love). “Run Away” is when it really gets fun and dark delving, as it distorts and crumbles the bass-lines and drums, obliteration is swift and easy for those dissatisfied with darkness. Ambience usually isn’t my thing unless it’s done right. I like buildup, short bursts of non-ambience, and back to ambience, like a movie soundtrack. The next song “Beacon”, featuring Dimi Kaye, is a prime example of my love for movie soundtracks and ambient tracks. It doesn’t sound ambient, not entirely, but it definitely has the vibe of it. It also has movie audio clips from November 1950’s “Earth Abides Part 1”. Nice touch there, Volkor, remind people of the good old days before everyone dies horribly. Nice. “The Bomb” was the pre-order track that Volkor X had up, and let me tell you…what a teaser track. It’s amazing and exactly what was expected of some good old Volkor X, it reminds me of “Tony Chew Is Dead” from his “Badass Inc. EP”, a pretty good fast paced action ride. This song maybe fits some kind of military protection, like fighter pilots and the such, all while blue beams of death cirle around the continents and orange lights float through the beams, all while audio clips from 1964’s “Attack On Space” play at random in the intro and partway through the track. “Hypersleep” is that brilliant usual ambience I loved. After Earth’s annihilation, the ships in the stars and everything aboard enter warp hypersleep, a job well done for the Volkor Foundation. Indeed, a job well done. The last track is the best for last track. “This Means War”, featuring Sylvain Coudret, a member of the band SOILWORK. Oh. My. God. It’s 13 minutes long, the solos by Coudret, the synths by Volkor, the destruction of my earbuds, the flames reaching down from the heavens, the world ends with this track and this solo. It brings tears to my eyes every time, and there’s nothing else that can fit it only but the climax of AKIRA, it’s unorthodox but it’s perfect. Humanity falls, Earth is doomed, war is won today by Volkor X. We never stood a chance, and yet we saw it coming. Thank you Volkor. 666/5 yet no Satanic imagery.